Upcoming shows where you can find me and my latest work. Also listed are past shows at which I have participated. If you are in the area near the NC east coast, come see me at this holiday market. 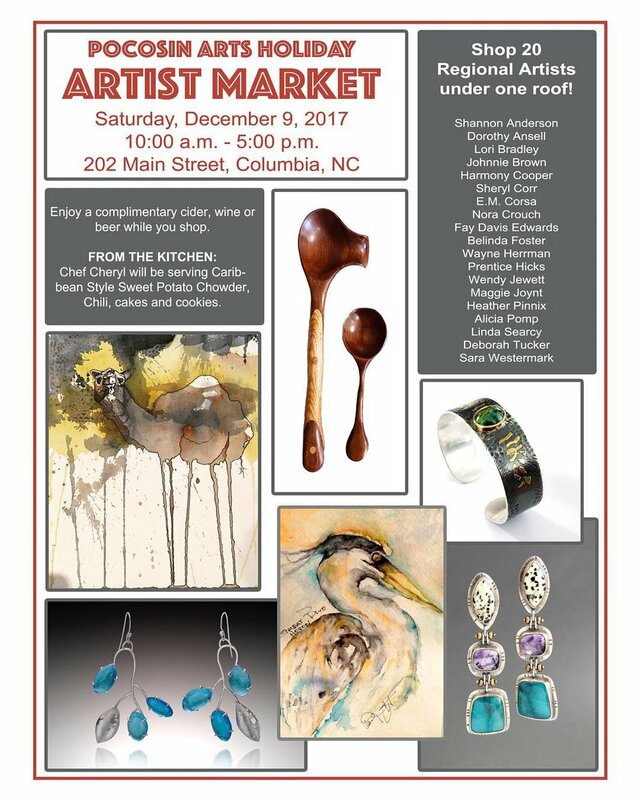 The Holiday season is near and on Saturday, December 9th, Pocosin Arts School of Fine Craft, in concert with the Town of Columbia’s Rivertown Christmas, will host a Holiday Artists’ Market in our Riverside Studios, located at 202 Main Street in Columbia, NC. Rivertown Christmas is an annual weekend event that begins on Thursday evening with a tree-lighting ceremony at the visitor’s center and goes through Sunday, December 10th with a variety of events throughout the town - from a Christmas Bazaar, a visit by Santa, and carriage rides. It is a well-attended event, usually drawing hundreds of visitors. With our Holiday Artists’ Market we hope to showcase the talents of the many creative artists that make their home in the region and provide an opportunity for artists to sell their work to visitors of the 2017 River Town Christmas festivities.